Solid 2015 Tithe Gain Reported by RMC Treasury » Just ahead of the Rocky Mountain Conference's Executive Committee, the RMC Treasury department released information about the 2015 RMC financial performance. "Having completed our fiscal year for 2015, we have much to be thankful for," said George Crumley, VP for finance. Tithe is a ma jor source of funding for the Seventh-day Adventist Church and during 2015, church members returned $15,662,903 in total tithe to the Rocky Mountain Conference. Included in that total is $340,850 of windfall tithe, or non-recurring tithe that is material in amount. "When the windfall was subtracted out," Crumley explained, "we had an increase of 3.55 percent in base tithe. This is a solid tithe gain." Such a strong tithe increase along with lower RMC medical costs for 2015 will enable the conference to support outreach and soul-winning ventures beyond what the conference had anticipated when the year began. 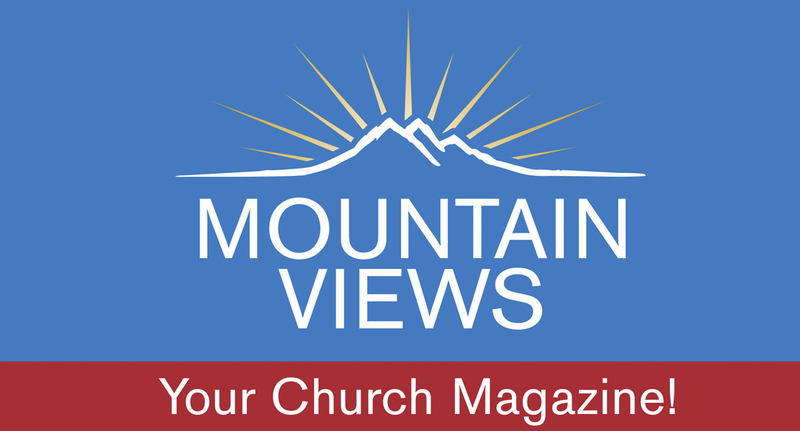 RMC Volunteers Show the Love of the Father to Their Communities » "One of the greatest challenges in serving the Lord is showing the love of the Father to His children," says Cathy Kissner, director of Community Services for the Rocky Mountain Conference. Cathy believes that our connection to Him is demonstrated in the way we greet volunteers, speak to representatives from other service agencies or meet the needs of clients. Over the years, Cathy has worked with many volunteers and has seen that the most effective ones are those who are consciously connected to the mission that Christ modeled for us -- feeding, healing and strengthening those in need. The Pueblo First Church, in conjunction with an organization called Foster Parents, provides a tote bag filled with items needed by children in foster care, such as blankets, hair and toothbrushes. Kathy Hayden leads another group of volunteers from Pueblo First Church who collect sleeping bags for the homeless. The Loveland Community Service Center blessed the children of their clients by holding a Christmas party. The children were captivated by the large Christmas tree bordered by a table full of stuffed animals. The room was filled with music and laughter as staff and guests played musical chairs, staged a "snowball" fight with wadded-up newspapers and engaged in other interactive games. Along with cookies and juice, the children received a bag (courtesy of Kaiser Permanente) containing a Dorcas-made quilt, stuffed animal and specialty soap. It was great fun and everyone agreed to do it again next year. The Campion Church got involved when a small tornado touched down near Carter Lake just west of Berthoud. 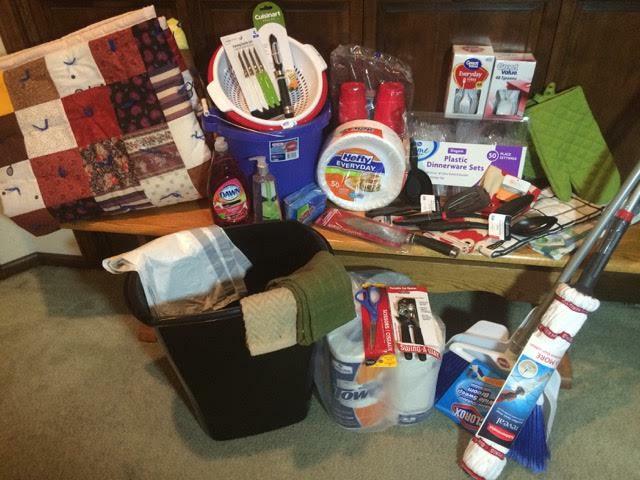 They created ten kits full of essential kitchen supplies to get families back up and cooking again. Along with this, they also filled baskets with useful items and delivered the baskets to the Berthoud Fire Department who, in turn distributed them to families impacted by the tornado. The Fort Collins Pathfinders and Adventurers created 16 Thanksgiving baskets from the 1,625 cans of food they had collected, along with fresh produce. The young people delivered them to families needing an extra boost during the holiday season. 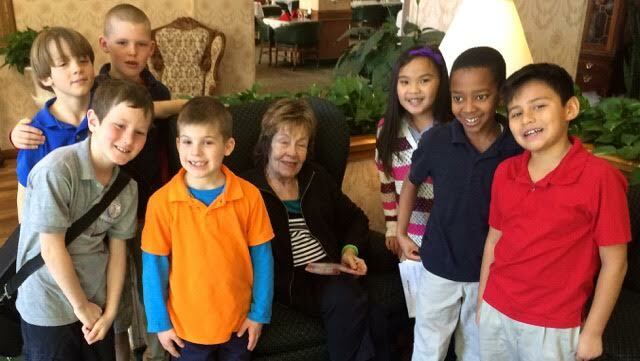 A group of Mile High Academy third graders, along with their teacher, Sandy Hawkins, brought a special chapel program to Porter Place Retirement Community residents, February 10. "Emotions were high among the third graders as each resident hugged, held their hands and shared how much they enjoyed the program," reports Agape Hammond, MHA marketing director. The students sang, played instruments and told stories in front of an attentive group of senior citizens. At the end of the program, students handed out eighty-five homemade Valentine cards. "Some of the residents were left with tears of joy in their eyes," Agape says. Winterfest New and Different » For more than 25 years, Winterfest has been blessing teens, youth, college students and young adults with great mountain-top experiences centered around skiing and spring break. Evolving over the years, it has become more family-oriented and has attracted more people from the Front Range rather than from the college scene. To accommodate our local Coloradans, Winterfest will be held at the beautiful Silverthorne Pavillion on Sabbath, February 27, with an 11 a.m. church service followed by lunch. The afternoon will be open for families to spend in the beautiful mountains. Join us for an inspiring message, amazing music, great food and warm fellowship on February 27. Silverthorne Pavillion is located at 400 Blue River Parkway, Silverthorne, CO 80498. For more information, go to RMCyouth.org/winterfest. Sharing the Great Controversy » Chenani Church in Aurora is organizing a special distribution of "The Great Controversy" in their area from 2-4 p.m, February 13, 14. For more information, contact Alan Brown at 303-915-6841. Chenani is located at 3600 Helena Street, Aurora CO on I-70 and Chambers, Exit 283. Mile High Academy » "The Perfect Class," a dinner theater presented by the 8th grade class at Mile High Academy will take place at 6:30 p.m. February 27. Tickets are $15 for individuals; $13 for four or more as well as for seniors. Proceeds go toward the 8th grade class trip to Washington D.C. and graduation. 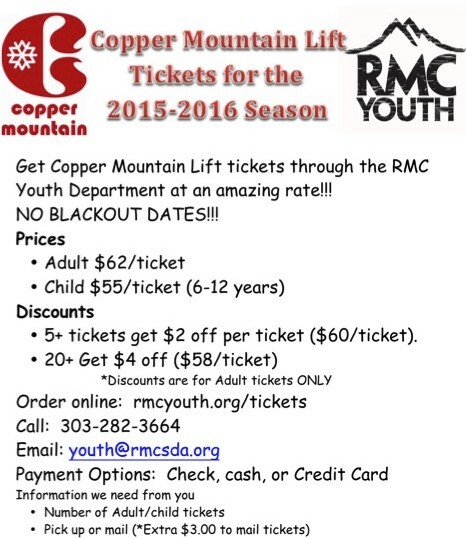 Purchase your tickets through class sponsor, Mrs. Rettler, or any class member. Littleton Church » Walla Walla University president John McVay and members of the alumni team will present "Passion for Christ" during a spiritual emphasis weekend beginning at 7 p.m. March 11 and continuing Sabbath March 12. All are invited. A potluck will follow with WWU providing a dessert buffet and community and church members providing the potluck lunch. Prophecy Seminars » Aspen Park Church, under the direction of Elder Ron Spurling, is holding an eight-week prophecy seminar from 2 to 4:30 p.m., Sabbath afternoons beginning March 5 and continuing until April 23 at Mountain Resource Center, located at 11030 Kitty Drive, Conifer 80433. You are invited to pray for Aspen Park's outreach to the rural communities in the area. Please RSVP to Elder Spurling by calling 303-596-0016. Mile High Academy » is hosting its annual "Bring a Friend to School Day" for K-12th grade. Invite a friend, be a friend, make a friend. Join us on Wednesday, March 30 from 8 - 3:30 p.m. As our friend, you will attend classes, participate in fun activities and enjoy lunch on us. Register online or call 303-744-1069 to save your place. Laura E. Mason Christian Academy » Clean out your closets and donate your new or gently-used shoes for a great cause! This fundraiser will help individuals in a country from the developing world. Support the amazing Cheyenne church school and get rid of those extra shoes lying around. Contact the school at 307-638-2457 or drop them off in the bin outside the school door at 723 Storey Blvd., Cheyenne. Thank you! NAD Children's Ministries Certification» Coming to Denver South Church, March 25-26. Those interested in this certification should watch for further details or contact Patricia Rivera, 303-910-3548. Associate Producer -- Media, Production & Programming: The Voice of Prophecy is looking for a passionate person who loves using media and technology to share the Good News. The ideal candidate should be proficient with audio, video and digital media production. This person should also be a strong manager who can design engaging radio shows, produce compelling TV, manage teams, run multiple large projects, and think about the future of media technology. Associate Director -- VOP Creative Department: Do you think and dream in the visually creative space? The Voice of Prophecy is seeking a creative professional who desires to use their talents for soul-winning and evangelism. Prospective candidates should be proficient and experienced in many creative areas such as: print design, brand creation, web design, UX design, motion graphics, 3D graphics and presentation graphics. Proficiency in the areas of video production and photography a plus. Assistant Supervisor -- Mailroom: Are you someone who loves logistics and has an eye for detail and a knack for supervision? If so, you might be the perfect candidate for the Voice of Prophecy's Mailroom Assistant Supervisor position! In this position, you would assist with the development, implementation, coordination and monitoring of all phases of mailing services in addition to supervision of mailroom staff. As a direct result of your work, people worldwide would receive resources like Bible lessons and make decisions for Christ thanks, in part, to your efforts in getting resources to them in a timely manner. February 16, 9:30 a.m. - 12:30 p.m.
February 17, 9:30 a.m. - 12:30 p.m.
March 1, 8:30 a.m. - 9:30 a.m.
March 1, 9:30 a.m. - 1:30 p.m.
March 29, 6 p.m. - 7 p.m.
April 2 -- 6 p.m. - 7 p.m.
April 3 -- 6 p.m. - 7 p.m.
April 4 -- 6 p.m. - 7 p.m.
April 6, 6 p.m. - 7 p.m.
April 7, 6 p.m. - 7 p.m.
April 9 -- 6 p.m. - 7 p.m.